Chinese e-commerce giant Alibaba (BABA) was one of the top stocks of 2017, surging more than 83% from a proper buy point to the year’s peak price of 191.75. And it all started with a cup with handle, one of the bullish chart patterns that the biggest stock market winners form at the start of their rallies. At its purest form, a cup with handle is simply the result of human psychology, as well as institutional support and resistance. Being able to identify a cup with handle is the building block in how to buy stocks and make money in the stock market. A successful base must first have a prior price uptrend of at least 30%. Alibaba did more than that when it rallied more than 85% off its lows in February 2016 to the cup-with-handle’s left side high price of 109.87 in September. From there, the stock declined as much as 22%, as it formed a 21-week cup with handle. The minimum length of this base is seven weeks. Ideally, the drop from the highest price within the base to the low will range from 12% to 33%. After a sharp move up the right side of the cup in January 2017, the stock quietly added a handle to the cup-shaped base. A handle needs at least five trading sessions, or one week, to form. Volume should quiet down. 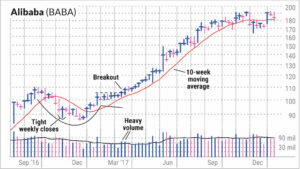 Alibaba’s handle was initially three weeks long, yet it stretched out as the stock really got moving several weeks after a breakout on Feb. 22 the same year. From high to low, the handle’s depth was just 4.4%. Normally, they are between 8% and 12% deep. The handle represents a final shakeout before the stock can burst above the buy point and notch new highs. When Alibaba surpassed the 104.67 proper buy point — a dime above the highest intraday price within the handle — the stock’s action was indecisive. Despite a 55% increase in the day’s volume compared to average, the stock closed below the entry. Two days later, the stock fell as much as 3.2% below the entry. But that’s much less than the 7%-8% loss-cutting sell signal. When a stock drops more than 7% below the proper entry, that’s the stock market telling you the timing isn’t quite right for this stock idea and to cut your losses. You can always buy it back later if it breaks out again. about three weeks later. The stock regained its buy point on March 13. Volume once again showed a strong uptick, rising 68% above average. After a mild two-day pullback, the stock rallied and never looked back. Investors who bought the stock this time could have more confidence — the preceding weeks showed a 3-weeks-tight formation, a sign of bullish institutional accumulation. Chinese e-commerce giant Alibaba’s quarterly earnings and sales grew 30% and 44%, respectively, ahead of the stock breakout. Today, Alibaba has built another cup with handle. As of Friday morning trading, shares deserve a spot among top stocks to watch because Alibaba moved past a 188.18 correct buy point in heavy turnover. According to IBD Stock Checkup, Alibaba boasts the highest IBD Composite Rating in the Retail-Internet industry at 98 out of a highest-possible 99. Through Thursday’s close, the group ranked in the upper half within 197 groups for six-month price performance.